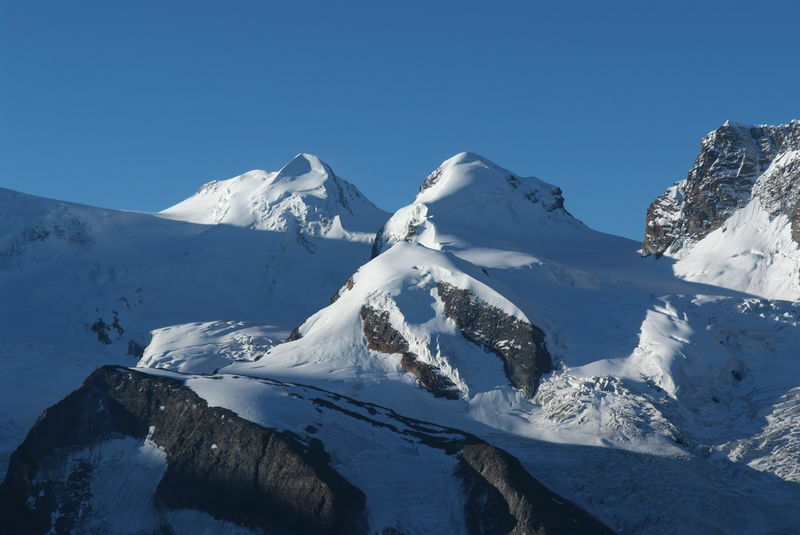 Castor (Italian: Punta Castore) is one of the two peaks known as the Twins. 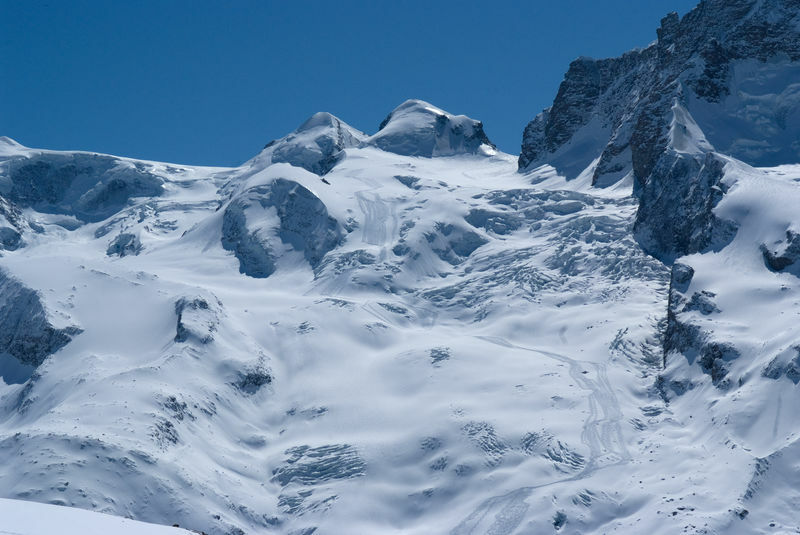 It is situated to the south-east of the smaller Pollux (4,092 m), which looks similar seen from the north-north-west. Castor’s rocky summit lies slightly to the south of the border, and is thereby in Italy. 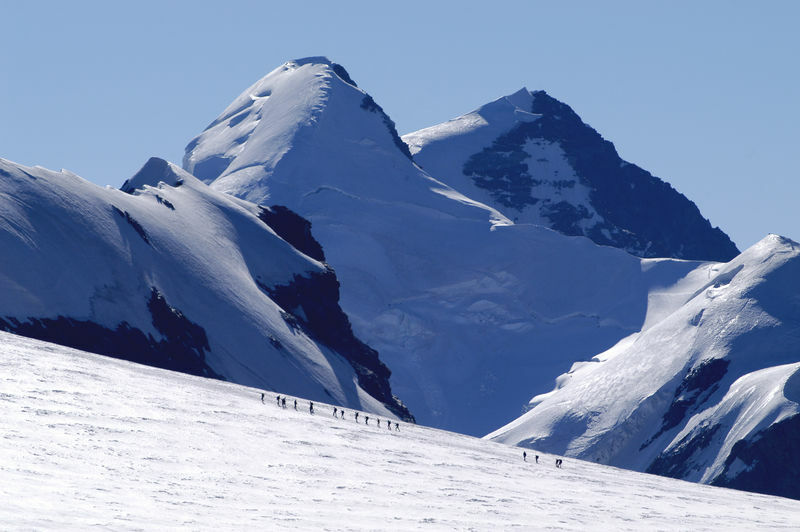 The twin summits of Castor and Pollux are separated by the Zwillingsjoch (Italian: Passo di Verra, 3,845 m). Castor is named after one of the Greek twins Kastor and Polydeuces, sons of Zeus. Castor is the Latin version of the name. The Ancient Greeks disagreed about Castor’s origin. For some, he was the son of Leda and her husband Tyndareos. As he was conceived in the same night as Polydeuces, they were twins, although, as the son of Zeus, Polydeuces was a half-god, while Castor was merely a mortal. Others believed that, like his brother, Castor was also a son of Zeus. The end of the twins Castor and Polydeuces was initiated by a quarrel started by Castor with his cousin Idas. Idas slew the mortal Castor, after which Polydeuces killed Idas’ brother Lynceus. Zeus then intervened in the quarrel by destroying Idas with a bolt of lightning. The immortal Polydeuces mourned his brother so much that he asked his father Zeus to take away his immortality so that he could join his brother in the Land of the Dead. Moved by so much love, Zeus allowed his son to choose to either remain forever young and to live among the Gods, or to stay with Castor alternately one day in the underworld of Hades (the Land of the Dead) and one day in Olympus with the Gods, and to thereby become older, and to finally die. Without any hesitation, Polydeuces chose the latter and, from then on, travelled between Olympus and Hades with his brother.